The truck accident lawyers at the Law Offices of Gary Bruce have extensive experience pursuing compensation on behalf of clients injured in 18-wheeler cases. For a complimentary consultation, please call 706-596-1446 today. Our firm serves clients in Columbus, Fort Benning, and nearby areas of Georgia, as well as clients in and around Phenix City, Alabama. One significant way in which trucking accidents differ from car accidents is the greater likelihood of multiple liable parties. The driver of the truck may be at fault for the accident for a host of reasons, but he or she might not be the only party who bears responsibility. As you can see, trucking accident claims can become complicated. Each of these parties likely has its own lawyers striving to minimize your compensation or shield their clients from blame. At the Law Offices of Gary Bruce, we make it our mission to ensure you receive fair compensation for your injuries. In addition to whether or not they have a case, many clients ask our attorneys “how much is my truck accident case worth?” The answer depends entirely on the circumstances of the crash. Each of these injuries requires extensive, costly medical intervention and long-term rehabilitation. In some cases, the effects of these injuries may permanently impact quality of life. If you or a loved one suffered these extreme injuries in a truck accident, our attorneys will pursue all of the compensation you deserve for medical bills, lost income, and other expenses that occur as a result of the crash. In addition to economic compensation, you may also be eligible for non-economic damages like pain and suffering. Truck accidents take a major toll on the victim’s well-being and quality of life. The goal of our lawyers is to ensure that you and your family receive the compensation you need and deserve. 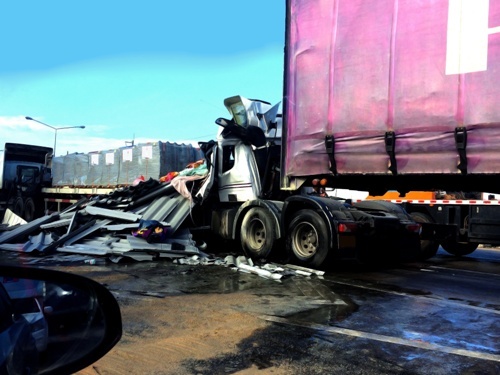 If you’ve been hurt in a truck accident, you should speak to a lawyer as soon as possible. The trucking company and other parties will want to settle the matter as quickly and for as little money as possible. The Law Offices of Gary Bruce serves clients in and around Columbus and Fort Benning, Georgia, as well as Phenix City and surrounding parts of Alabama. Our lawyers are ready to take action on your behalf if you or a loved one was injured or a family member was killed in a truck accident. Please call 706-596-1446 today for a complimentary review of your case.